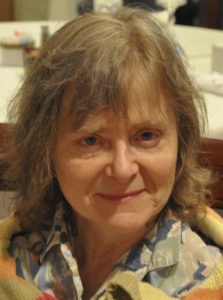 Our featured caller, Gaye Fifer hails from Pittsburgh, PA, a town with deep dance roots. She has called contras at dance weekends across the country. She is also an extremely proficient caller of English country dance. Her style is warm and patient, but oh so very persuasive. Gaye also is an amazing teacher of waltz. Her waltz workshops are in great demand. She sometimes teaches waltz with her partner, Wayne Albright and other times on her own. We are thrilled that she will be teaching waltz at this year’s PMFF. And we will include a few extra waltzes in the Saturday evening dance so that workshop participates can put what they have learned to use. The inimitable David Kaynor, ever courtly and with years of experience and fine judgment as a caller, will be with us. 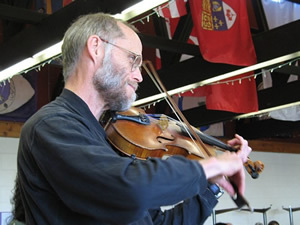 Although mostly filling the role of fiddler extraordinaire at the weekend, David will also grace us by calling a session of contras on Saturday afternoon. What a treat! Finally, we have once again managed to coax the reclusive and quirky Squash Family Callers from the backwoods to call a session of squares at our weekend. 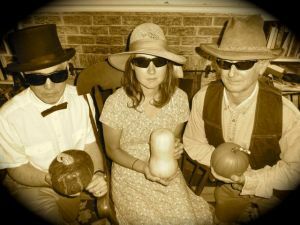 Doc, Sadie and Nick Squash will be joined by a newly discovered cousin — don’t miss… Summer Squash! (not pictured here). Two fine trios will provide most of the music for the weekend. 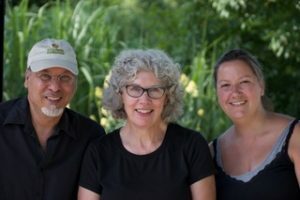 New Brew combines the considerable talents of Eileen Kalfass (fiddle), Jane Knoeck (piano and accordion), and Tom Santarsiero (guitar, mandolin and feet). 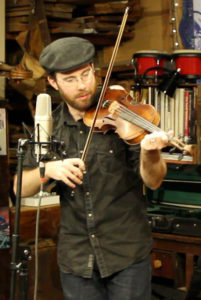 They play a wide range of tunes from multiple musical traditions. Their contra dance music always sets up a groove. Their playing is dynamic, smooth, tasty and goes down like a fine ale. It’s no wonder that they are in such demand. 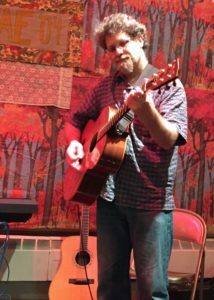 Our other trio combines the considerable talents of Tim Ball, David Kaynor, and Marko Packard, three musical wizards who will whip up a powerful mix of guitar and fiddle music with masterful harmonies guaranteed to carry you into contra bliss. These folks have fantastic musical pedigrees, and love playing together. On top of that, they are really nice people! Also, if you come first thing on Saturday, expect to be delighted by the dulcet tones of Laurel Sharp’s recorders. Laurel is a beloved musician who plays frequently for English country dancing in our region. She will be joining Eileen and Jane from New Brew to provide music for the morning English session. 11:30 – 1:00 Contras with David K. and New Brew Morning Yoga: Rita Anderson will help get the kinks out. Pre-registration by mail and online are now closed. There is still space at the weekend, though, and we’d love for you to join the fun. Click here for information about prices at the door. You Can Help — Volunteer! Contact Patty at any time to volunteer for our dance organization, including if you’d like to help out at the Phylla Mae weekend. Volunteers may help with decorations, floor sweeping, kitchen duties, tear-down, etc. We also encourage you to bring something to our Friday potluck at 6:30 PM before the first dance of the weekend. Thanks for lending a hand! Our venue is the United Church of Fayetteville which is also where most of our regular dances are held. It is located at 310 East Genesee Street in Fayetteville, NY. From either the NYS Thruway or I-81, get onto I-481. Take 481 to exit 3E. This puts you on E. Genesee St. (Rte. 5), heading east. The church is about 3 miles from that exit. You should stay to the left at the fork at Lyndon Corners to follow Rte 5. The church will be on your right in the village of Fayetteville. Phylla Mae was the “nom de dance” of Phyllis Antos — the name she always put on buttons or nametags at the many dance events she attended. Phyllis was one of the organizers who got our fall dance weekend off the ground in its first two years. After she was killed in a head-on collision on her way home from a clogging team rehearsal, our Board voted unanimously to name the weekend after her, since she loved it so much and worked so hard on it. 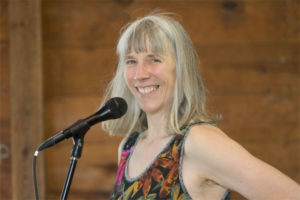 Phyllis’s favorite contra dance was Delphiniums and Daisies by Tanya Rotenberg, and we often find a way to include it in the weekend.